I have a 1974 Honda CB550 for sale that underwent a "mild" restoration a couple of years back. 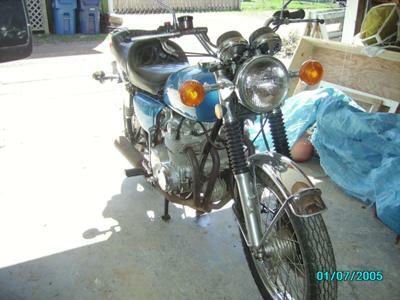 The 1974 CB550 for sale is in good mechanical condition, super clean and nice running. We would also like to encourage our friends to write a review of the 1974 Honda CB550 for sale to help Our visitors that might want to buy make informed decisions and to benefit the biker community as a whole. The used Honda motorcycle for sale is located in Cleveland OH Ohio 44102 and if you're interested or have questions please feel free to give me a call Mon-Fri 10-5 at (no e-mail) 216-651-0six57 and don't forget to mention that you found this ad on GoGoCycle's Used Motorcycles and Parts for Sale www.gogocycles.com when you call.